The Society of Laboratory Automation and Screening (SLAS) partnered with David James Group to ideate and execute a membership campaign that positioned SLAS as a premier partner in the trajectory to professional success in the life sciences community. SLAS had shifted the association's brand positioning around two concepts: Discovery and Technology. Discovery represents the people doing life sciences research and making discoveries every day in life science laboratories. Technology represents the organizations providing technological advances to make those advances in research and discovery possible. Together, Discovery and Technology make up the SLAS community. So DJG focused on this to develop a new membership campaign that represented Discovery and Technology in life sciences. Membership at SLAS puts you at the center of the life sciences discovery and life sciences technology community. So, we encouraged the target audience to "Center Yourself." We approached the new membership campaign with a simple creative look and feel, featuring dynamic graphics that echoed the connections that SLAS facilitates. With an audience of scientists, engineers, researchers, and entrepreneurs, simplicity and cleanliness were key. Elements of the membership campaign included advertising, a brochure, social media graphics, web graphics, and a video campaign. 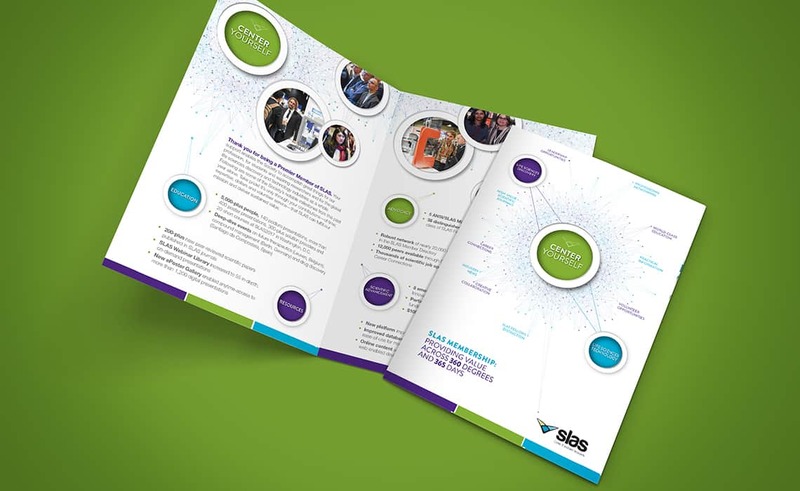 The brochure was distributed to new members and member prospects, demonstrating that SLAS gets you immediate access to member benefits that put you on a trajectory to professional success. 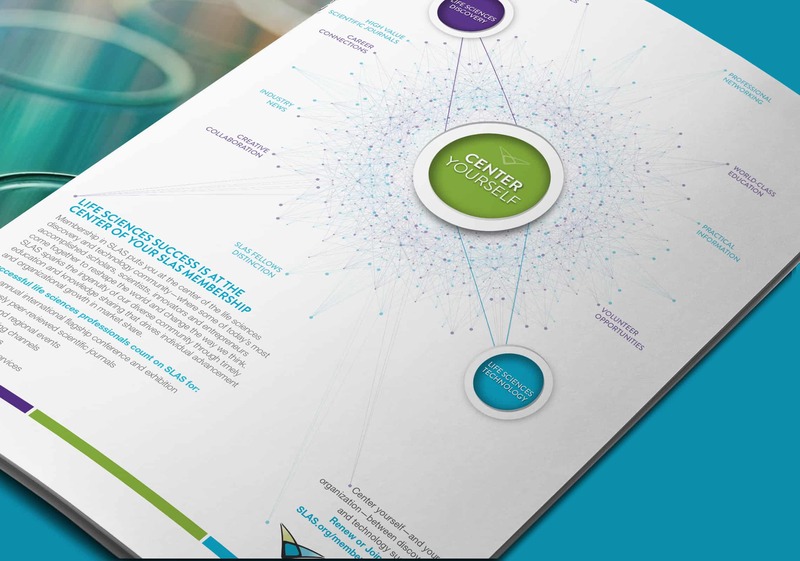 The advertising campaign ran in SLAS' house journals, SLAS Discovery and SLAS Technology, where members learn the latest in life sciences discovery and technology. The launch video for Center Yourself mirrored other campaign elements in terms of look and feel and gave viewers a simple overview of membership benefits of SLAS and why being part of SLAS will put you at the center of life sciences discovery and technology. Email us or use our live chat feature below to learn more about how you cause a stir with your next membership marketing campaign.